I can bloody see him just up ahead! Get your head down. Keep the power on. Everyone else is walking, trudging across the saturated field. I’m still riding, flying past people at 3mph, with my head buried in the bars. Trying to spin circles as the ground beneath me slurps at the wheels, pulling me down, sapping energy. I can see him. A glanced shot into the distance. He’s off the bike and clambering up the unridable slope. Close enough to make out the writing on his jersey. Keep fcking pedalling. I hit the steep slope and dismount. Someone’s spray painted “MTFU” on the grass to the side. They’re right. No running practice has been done in preperation. In fact no running at all. Doesn’t matter. Force the legs up the hill, dragging the bike. Get to the top and get back on now! Final footsteps as I crest the climb and throw myself back into the saddle, amid cheers and encouragement from the spectators. Back riding, back at home and back on the singletrack, swooping through the stodge and slither as the race worn mud plays with the tyres. Flow with the course as the rain water flows down through the ruts and holes dug into the treelined lap. Blinding spray leaps up, requiring feel for the ground to keep everything upright and facing the right way, give the tyres room to move in the unstable slime. Stay off the brakes. Keep and eagle eye out for him, in between the lashings of watery grit, as riders are caught and passed. Any flitting through the trees might be him, every corner promises a glimpse – am I catching him? Keep the hammer down. Power out of every corner, head down on every straight. Rail every berm, of which there are many, and keep your lungs on the outside all the way. I bloody love this race. Double the length of your average ‘cross race and with more technicality in the course, yet short enough to be a sprint and with enough fast sections (in between the unridable bits…) to keep you straining, on your toes, it’s in a league of it’s own. My plan to take the race on by simply drinking a large can of overly-caffeinated, sugar rich ‘energy’ drink before the start and hoping the subsiquent hyperactivity would last until the finish line was going well. I was in third. 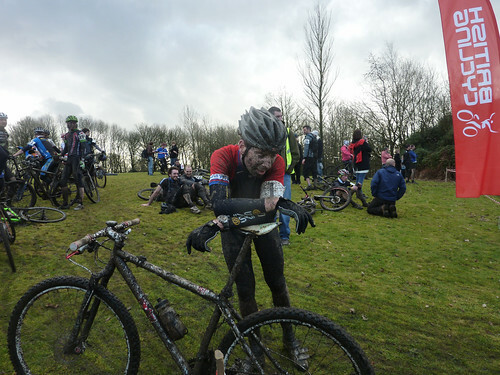 Chasing Dave Haygarth in second, surprising even myself with just how well I was riding the tricky stuff. 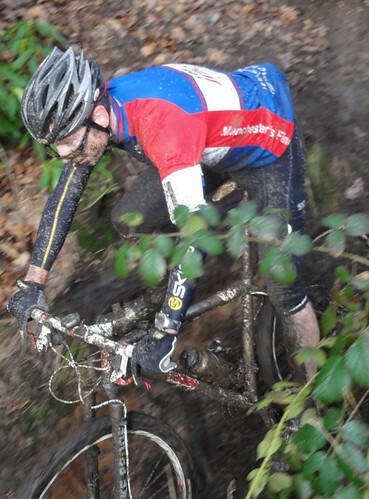 I’d made the right decision bike wise; the TD1, shod with mud specific tyres was simply flying. Any moments where I’d get caught behind slower riders on the narrow sections were turned into short, breath catching breaks before exploding out of the saddle and hurling myself round corners so fast my stomach would lurch. Everything was coming together. Proper flat out racing. Sadly, the fizzy drink experiment backfired somewhat as, 1hr 40mins into the 2 hours the caffeine wore off, the sugar ran out and I found myself fighting empty legs and jittery arms. With no means of replacing the energy my body was calling for I lost sight of 2nd as the grimaces began to take hold, and started hoping that I could hold onto 3rd. I started the last lap, felt something fly past me and knew I’d either been lapped by the leader (unlikely) or had dropped down to 4th. Cross the line. Congratulations and commiserations all round. Chats and natters. Grins everywhere as mud plastered faces begin to set in the lunchtime sun. Even those nursing broken bikes are singing praise. Suddenly finishing positions don’t matter, any chasing down is done to have a quick catch up on how the race went for others and even race-sharpened elbows are tucked away as a queue forms for post-race brews and fine northern dining from the catering tent. Damned successful event – what a load of fun it is. It shouldn’t be, but it just is. Hard luck for blowing up mate – thought that would be the last think a mileage man was likely to do. I had a spare caffeine Gel that was tapped into at 1 hr 30 then I was fine, but no bottle, so was a bit parched and sticky throated by the end. I’d have mugged you for that gel.